Ah, here we go! Most of DCUC Series 17 duplicates figures we've already reviewed from DC Direct, but at last, this one's new! One of the most brilliant men on Earth, Professor Ray Palmer became The Atom after creating a belt that allows him to shrink to microscopic size. After his best friends Hawkman and Hawkgirl were murdered and transformed into Black Lanterns, Ray was granted an Indigo Power Ring to assist in defeating the Lord of the Dead, Nekron. The Indigo Tribe wields the power of "compassion," which is a bit tricky to wrap your head around. What sets them apart from the Star Sapphires, who are powered by glowing vaginas by love? The terms are synonyms, after all. It would be like if there were one Corps powered by hope, and another powered by aspiration - redundant. But how about this: love can be selfish, focused only on the object of that love; but compassion is more like empathy, understanding others' emotions, and wanting to do something to help them. Think of it as a combination of love and will. 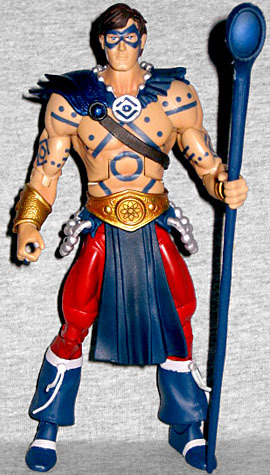 Since the Indigo Tribe dresses simply, in hand-made robes rather than full uniforms, Atom's wearing a costume reminiscent of his days as a barbarian (in Sword of the Atom). He's shirtless, with a shawk over his shoulders and armor strapped onto his right shoulder above that. He has a silver necklace with the Indigo symbol, as well. There's a large golden belt with the Atom symbol in the center, a thick blue loincloth and silver beads on the hips. His pants are the same as usual, but his boots are now buccaneer style, with thick, folded tops. There are wraps around his shins and feet, and golden bracers on each wrist. There are a lot of new sculptural pieces on this figure, and for once it's not just his head. The forearms, shins and even the feet are new, since the cloth wraps are actually sculpted on - even under the feet! He gets a new right hand, too: he's not just wearing a generic ring, it's got a tiny Indigo Tribe symbol sculpted inside. How do they do that?! The paint is very important on this figure, and luckily the one I got from ordering online is quite good. 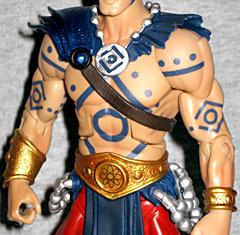 Not only are the edges of his costume free from any major mess, all the Indigo Tribe symbols painted on his torso and arms are crisp and clean. If these had been blurry, like Wonder Woman's legs, they would have looked really bad; yes, it's body paint, but it's not airbrushed on, you know? There is a smudge on the back of mine, part of an errant fingerprint, but that's more forgivable than a feathered edge. Articulation is the standard, but having a big circle painted on the chest and back right where the torso hinge is definitely lets you know where the "right" place to position him is. Atom comes with one accessory, the carved staff that serves as the Indigo battery, rather than a traditional lantern. And yes, unlike the other figures in this series, who never actually got batteries of their own, this is an accessory he should have. One of the abilities the Indigo Tribe displayed was access to the powers of all the other spectrums - they can vomit red blood, they can raise orange doppelgangers of the dead, they can encase enemies in sapphire crystals, all that - it's part of the "understanding others' emotions" we mentioned above. The staff is 6¾" tall, taller than Atom himself, and sculpted with a wooden texture everywhere but the "lens" in the top. It can be held in either hand, or in both if you wish. The figure includes the right arm of the Series 17 Build-A-Figure, the Anti-Monitor. 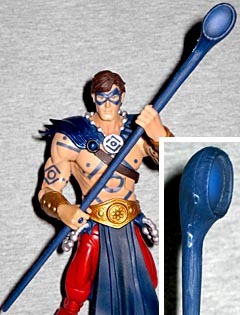 The "skin" is silver banded metal, and the blue bracer connects to the shoulder via a thick golden tube. All the paint is metallic, giving him an appropriate shine. The arm moves at the wrist, elbow, bicep and shoulder, so it'll be perfectly mobile when you plug it into the torso. Mattel hadn't even given hints of this series when DC Direct was soliciting their candy-colored cavalry, and since I wanted to get at least one figure of each color, I ordered the DCD versions. Then Mattel revealed this series literally the same day DC Direct's Blackest Night toys hit stores, and it was too late to cancel the orders or turn down the figures (because that would be rude), so now I have two of everyone. Everyone but the Atom. I already had Iroque, so Ray Palmer was unnecessary. That worked out for the best, however, because now not only do I have an Indigo Atom, he's one of the few figures in this series that's worth buying on his own merits, not just because he comes with a BAF part.